Unless you’re a certified bus fan (and a certified old guy), it’s unlikely you’ll recognize this coach. Motor Coach Industries (MCI) built only 100 of them for Greyhound between 1969 and 1970, and they spent most of their time on roads in Canada and on the two US coasts. When introduced, it was probably the most unique intercity bus in service. 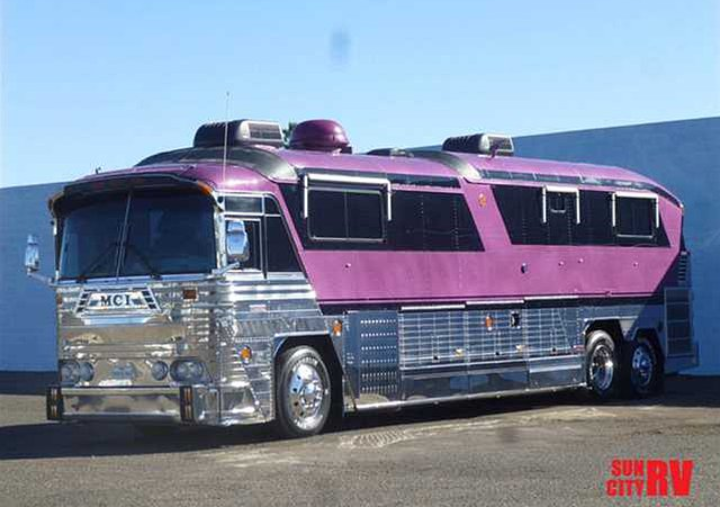 It’s an MCI MC-6 Supercrusier. 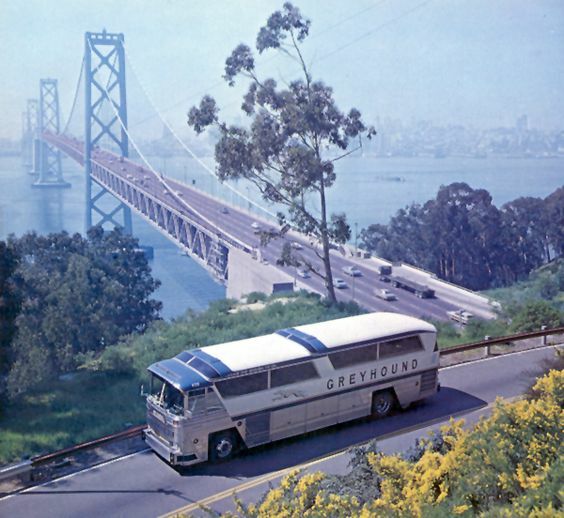 First some history – by the mid-1960’s, Greyhound’s General Motors PD 4501 “Scenicrusiers” were getting tired – they had been in front-line service for a good 10 years and needed to be replaced. You may remember that Greyhound purchased MCI in 1959 to serve as its sole source provider, largely based on its disappointment with the 4501, which had initial powertrain reliability problems and later developed cracked frames. MCI already had their successful MC-5 as a replacement for older GM 4104 and 4106 models. But the company needed a larger, high floor model also, so to meet this requirement, MCI developed two new buses jointly – the MC-6 and MC-7. The MC-6 was certainly the more unique of the two. How so? Size: The MC-6 was the first 102 inch wide 40 foot long intercity coach. At the time, Canada and several US states on both coasts had increased their interstate highway maximum vehicle width dimensions from 96 to 102 inches. Greyhound had assumed, incorrectly, that other states would follow suit and adopt these wider limits also. But many states kept their 96 inch rule until the Federal government enacted the Surface Transportation Highway Act in 1982 which standardized the 102 inch width on the entire national highway network. As such, these buses were confined to routes in Canada and along the two US coasts. Initially, the MC-6s operated only on the East Coast, but later were all sent to work on the West Coast. At least the first two prototypes had their non-driven tag-axle wheels covered by bodywork, like this one seen in San Francisco, but the production versions had exposed wheels. And one of these two prototypes used a Mercedes 8 cylinder diesel, so it appears that MCI and Greyhound were in the same quandary as they had been back when they built the Scenicruiser: the lack of a just-right sized DD engine for this bigger bus. Power: The MC-6 was one of few coaches to use the GM/DD 12V-71 engine, a 14 liter, 852 cu in V-12 monster than twisted out over 400 hp and 1200 ft lbs of torque (other versions would go up to 600 hp). With its unique two stroke exhaust note, this engine was nicknamed the “Buzzin’ Dozen” and was paired with a Spicer or Fuller manual transmission. It gave these buses superb performance, albeit with a penalty in fuel consumption. The eighty-five MC-6’s in the US (fifteen remained in Canada) were subsequently re-engined with the 8V-71T and Allison automatics in 1977 when they were sent to the West Coast. The US fleet was retired in 1980, and sold off to other operators. The Canadian MC-6s retained their DD 12V-71 engines and manual transmission. Multi-stepped Seating Area and Roof: Most models in the late ‘60‘s-early 70’s had stepped seating areas and notched roofs; the GM Buffalo, Eagle Model 05, etc. The MC-6 had two stepped areas (not including the entrance); three steps up to the first seating area behind the driver, then one additional step up to more elevated seating from the middle to the rear of the bus. In turn, the roof had two notches instead of one. This made it 12 ft tall at its highest point, so it was not only the widest but also the tallest intercity bus then in operation. The more mainstream MCI MC-7 (96 in wide, 40 ft length) developed in conjunction with the MC-6, achieved much greater success, with over 2500 being built, and soon became the mainstay of the Greyhound fleet. But the MC-6 was the largest (non-articulated) and most powerful intercity bus on the road until the introduction of the MCI 102A3 and Eagle Model 15 with the DD 8V-92TA engine in 1985. Truly ahead of its time; six inches too much so, actually. Please keep these fascinating and informative articles coming ! . They bring back so many memories of traversing the East Coast in the late 1960’s…. Agreed!!! Thank you! Wonderfully informative and helpful in bring my dreams into a clearer focus! I know what I want! Now it’s just a matter of finding her!!! Awesome busses! I have found one of these and i’m going out next week to see it. I’ll take lots of photos and get back to you on the condition it’s in. Just curious where you found one. How did it go? These were a regular sight here in Vancouver, BC. I guess starting their trips south to the USA and cross Canada trips also. Surprised that only 100 were built. “Demonic DD V12” – great adjective. Jim. Certified bus geek here. I learned something new today. Thank you! A group of MC6’s were stationed in commute service in San Diego. I often rode them from downtown to Chula Vista. They replaced GM fishbowls and older GM 4801’s. I didn’t realize the 102″ width and wondered how we rated such a big new bus on a commute line. History revealed. Anyone know where these were built? I live not too far from the MCI plant in Pembina, North Dakota. According to Wikipedia, the Pembina plant opened in 1963. In checking, it appears these 6’s were built in the Canadian factories in Ft Garry Winnipeg as both the St Matthews and Pembina plants required expansion to build 40 ft coaches. Here’s some more info if you’re interested. Jim. Interesting…thanks. Needless to say, on my side of the 49th parallel, we think of MCI’s provenance as Pembina more than Winnipeg. Bias, of course…. Love this article! Growing up in the 60s/70s with an aircraft mechanic father, my 2 brothers and I were and still are fascinated with everything vehicular. CC, please keep this great stuff coming! Can’t get enough of those random-day inner city scenes with the dreary rain puddled streets, old 70s vintage cars (with a hubcap missing here and there), and the attendant backdrop of tall and ominous looking buildings in the mid-west. For some reason these scenes really tap the senses and brings out a slew of emotions. I guess it really reminds me of when I was young and dependent and vulnerable and relied on parents for safety and security (which they provided, thankfully) while I had this sense that the outside world was a big scary place but I was still in a place of safety. Full of awe and wonder, too. Anyway, I’m a bus lover myself as a current 38 year old — I guess I’m an old man, now… boohoo (and of course the Baby Boomers and GGers will scoff at that saying that I’m still a baby, but then again Millenial-Gen Zs thinks I’m dinosauratic… whatever… is what it is). However, I’ve always been interested in them since my youth, so there’s my personal balance of the age issue thing. Even though I’m not a whiz brainiac of the ins-and-outs of coaches themselves, I very well could be if I expended more effort. I guess that will take time as I get older. Okay, now I see the connection with the age thing. Anyway, great bus pictures and article, I really enjoy the series of motor coach articles often seen on CC. It also lead to me just spending about 40 minutes watching (well, more listening) to youtube videos of that Detroit Diesel 12V71 in action. Such an amazing sounding thing. I don’t recall ever hearing the name “Buzzin’ Dozen”. But I won’t forget it now! We always just called Detroits DDADs, as in “Detroit Diesel Allison Division”. Or, just Jimmies. As usual, very interesting. Regards the M-B engine, do you have any further details? The only 8 cylinder M-B engine of that period which springs to mind is the OM 402 which, back then, was significantly smaller and weaker than the DD (12.3L/778 c.i. and 252 hp respectively) so that I am not sure what advantage it would have offered MCI. It was also not known for being particularly fuel-efficient or reliable. Later versions were bigger and more powerful but this only happened in the mid 1970s. The source is just a snippet about the two prototypes. And they might well have gotten the cylinder count wrong. But it would appear that Greyhound/MCI were looking at alternatives, as they undoubtedly felt that the 8V-71 was presumably too weak, and the 12V-71 a bit of overkill. Yet in the end they did use the 8V-71 in the US, bit perhaps by then it was available in a higher output version. Or they kept it away from mounters areas, unlike the Canadian version. Road & Track magazine did a “road test” of a Greyhound bus back around 1969-70 in their April edition. I remember being impressed at the idea of a V-12 in a bus. The article mentioned that they had non-synchronized 4-speeds and were not very easy to shift. engine was used? Mercedes commercial diesel engine history does not list an 8 available in 1967 to have been used. Please clarify your information source on this fact. I recall seeing these buses deadhead eastbound along W 40th St enroute from what was then the Greyhound garage at 11th Ave (now an MTA bus garage) to the Port Authority Bus Terminal at 9th Ave. They were an imposing site at the time. I rode one of the prototypes, EGL #4599, back in the fall of 1967, when it and it’s sister, #4598 were holding down the overnite New York City/Chicago nonstop Turnpike Express. 4599 had the DD 12-71, and ran reliably during the three month trial. They had MCI factory techs riding every trip. #4598 had the Mercedes engine (I thought they said it was an 8. It did not fair too well, and spent most of the trial period in the garage, replaced by a PD-4501 Scenicruiser. When they went into production,GL used them on the New York City – Buffalo-Toronto-Sudbury-Calgary interline trips. They also used them on the New York City to Philadelphia trips. Some of them were used on Florida intrastate trips. There was a single one, used on a Fargo-Pembina-Winnipeg local. It’s huge cargo capacity came in handy, transporting Company parts shipments. When the Supercruiser’s were sent to California, they squeezed in another row of seats, and even installed cash fare boxes, used on the San Diego -San Ysidro local. 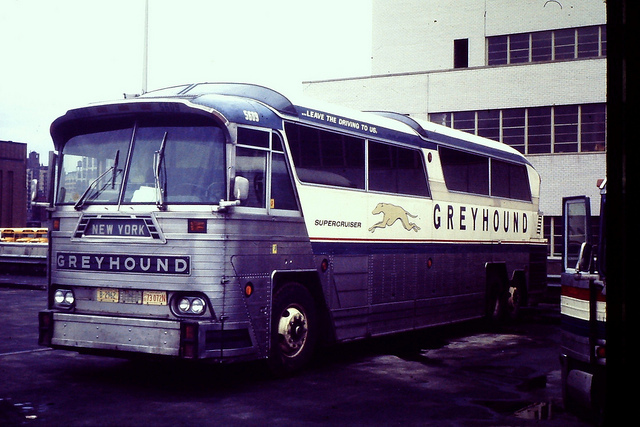 Greyhound ran a MC6 between Minneapolis and Winnepeg back in the mid 70’s. What a tank that thing was .